About 160 miles north of Manila lies La Union Province. Here the white sand beaches blend with the hills that form the base of the Cordillera Mountain Range. Baguio, the "Summer Capital" of the Philippines, nestles 5,280 feet above sea level, but, it’s at sea level you’ll want to remain when you find Ocean Deep, La Union. Beneath the waters of the Lingayen Gulf lies an enchanting world of coral and crustacean, caves and canyons, walls and wrecks. 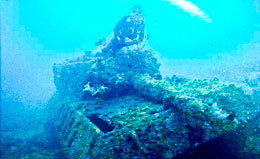 Here you can dive on the swim-throughs at Research Reef, explore the World War II tanks at Fagg reef, tec dive the mystery wreck at 245 feet, or probe the remains of the Japanese WWII Sea Plane Carrier. And what a better way than with PADI’s new Tec Deep or Tec Trimix. The latest in advanced deeper diver training. Call today for more information. 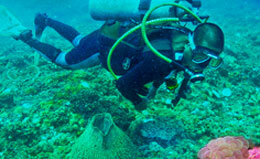 Get in on the top of this fast growing technical diving field. OPEN EVERYDAY 8 am — 4 pm, Westside San Fernando Airport, on the beach. But La Union offers more than diving. The calm waters and gentle breezes of the Lingayen Gulf are ideal for small boat sailing and windsurfing, or ocean kayaking. Fish in motorized outrigger boats ("bancas"), the local taxis of the sea. Picnic at the Hundred Islands, then visit the World War II landing sites of both the Japanese and the American forces. 10 complete sets of equip., 25 AL. tanks, Tec gear, Oxygen, Helium and Nitrox blends available. All right on La Union’s best white beach area,west of the airport, San Fernando City, La Union, Philippines. PAY SIX IN ADVANCE GET ONE FREE !!! Beneath the waters of the Lingayen Gulf lies an enchanting world of coral and crustacean, caves and canyons, walls and wrecks. These old WWII tanks were jettissoned towards the end of the war. We can guide you safely there. 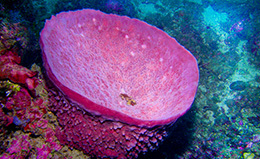 We will show you all the most interesting and colorful places in the South China sea.